Trimble will hold its first user conference in China on December 15-17 at the Jiuhua Resort and Conference Center in Beijing. It will cover civilian technology only. The theme "Exploration Has No Boundaries," draws comparisons between 15th century navigator Zhenghe, the 2008 space mission Shenqui, and the use of positioning technology to steer exploration. 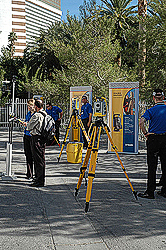 Trimble head Steve Bergland will deliver one of the conference keynotes. Sessions will cover surveying, engineering, construction, mapping and GIS, geospatial, infrastructure, mobile resource management and precision agriculture. Participants will learn how positioning technology can be used in various applications for high speed route optimization, airports, highways, utilities, emergency relief, and more. Beijing Jiuhua Resort and Convention Center is located in the Changping District in the north section of the city next to the Six Ring Road. By car, it is a 90 minute drive from downtown Beijing and 30 minutes from the airport.